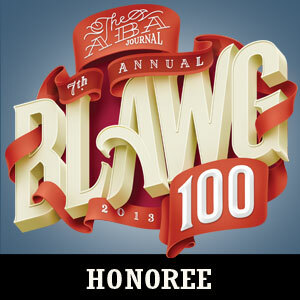 Arms Control Law Chosen as one of the ABA Journal’s 2013 Blawg 100!!!!!!! Remember back in July when I posted that the American Bar Association Journal was seeking nominations for its annual list of the 100 best legal blogs? Yeah, me neither. I had basically forgotten about it, thinking that there was pretty much no chance ACL would make the list. But I just got the official word today that Arms Control Law has been chosen for the ABA Journal’s 2013 Blawg 100 list, as one of the top 100 best blogs for a legal audience!!! We are highly impressed by this freshman blog—even if its matter-of-fact posts on bioterrorism and nuclear proliferation keep us up at night. The bloggers have their fingers on the pulse of the sometimes-clandestine international arms race and the treaties that aim to stop it. Columns have examined fallout from the NSA surveillance scandal and legal implications for chemical weapon attacks in Syria. It’s a must-read for foreign policymakers, but also easily accessible to the layperson. I’m really thrilled about this. Its extremely gratifying. I don’t want to turn this into an academy award speech, but I do want to thank our readers who took the time to nominate ACL for this distinction. Blogging is something that I only started doing a little over a year ago, and I do sometimes question whether the benefits outweigh the costs of time and effort, and the fights that I seem to get pulled into. But I have found blogging to be overall a valuable complement to my normal academic work, and this new recognition helps to convince me that our efforts here are seen to be valuable by others. This will help to keep me going. So congratulations to all of my fellow bloggers, and thanks to our readers!!!! Is the IAEA Actually Starting to Listen and Apply Legal Standards More Correctly?!? I was just reading over the new IAEA DG report on Iran, released today. It struck me that the first paragraph of the summary section, which has remained pretty much unchanged for a long time now, suddenly has been changed – only slightly but I think significantly. 67. While the Agency continues to verify the non-diversion of declared nuclear material at the nuclear facilities and LOFs declared by Iran under its Safeguards Agreement, as Iran is not providing the necessary cooperation, including by not implementing its Additional Protocol, the Agency is unable to provide credible assurance about the absence of undeclared nuclear material and activities in Iran, and therefore to conclude that all nuclear material in Iran is in peaceful activities. 65. While the Agency continues to verify the non-diversion of declared nuclear material at the nuclear facilities and LOFs declared by Iran under its Safeguards Agreement, the Agency is not in a position to provide credible assurance about the absence of undeclared nuclear material and activities in Iran, and therefore to conclude that all nuclear material in Iran is in peaceful activities. See the difference? The new DG report dropped the phrase “as Iran is not providing the necessary cooperation, including by not implementing its Additional Protocol”. I’m really not sure how to account for this difference. As readers will know, I’ve written at length about the IAEA DG reports on Iran, and specifically how, in this first summary paragraph of those reports, the IAEA has utilized incorrect legal standards in making an assessment of Iran’s compliance with its safeguards obligations. While this new formulation of the DG’s finding still refers to the agency’s inability to assess the absence of undeclared nuclear material (which it really shouldn’t, because according to Iran’s current safeguards obligations it’s not the IAEA’s job to assess this fact), nevertheless the removal of the indicated phrase does significantly change the tone of the sentence, from one which places the fault for this inability of the agency on Iran, to instead stating as a more neutral fact that the agency simply “is not in a position” to make this assessment. Honestly, I think this is a big improvement, and I think it goes a long way towards rectifying the erroneous expression of legal standards that has been present in IAEA DG reports on Iran for some time now. Because honestly, the DG report on MOST NNWS could say the exact same thing – even if they have both a CSA and an AP in place. Now, I know that the IAEA has in the case of some states reached a point of confidence about the absence of undeclared material, at which they are willing to reach a “broader conclusion” that all nuclear materials within the state are in peaceful use. However, according to the 2012 safeguards statement published by the IAEA, out of the 179 states that have safeguards agreements with the IAEA, the IAEA could only make this broader conclusion, including undeclared nuclear material, for 60 of those states. Meaning that there are currently 119 states, including Iran, about which the IAEA could make the exact same statement, verbatim, that it has made in this first summary paragraph of the November 14 safeguards report on Iran. I think this really helps to put Iran’s safeguards obligation compliance into its proper context. Iran is currently in compliance with its safeguards obligations with the IAEA. As with 118 other safeguarded states, the IAEA is simply not in a position to determine that there are unsafeguarded nuclear materials in Iran. I think that this finding, when properly understood and contextualized, helps significantly to bring perspective to Iran’s standing with the IAEA, and with its international nuclear obligations. Friend of ACL Bob Kelley, who is one of the most qualified people on the planet to discuss the technical aspects of nuclear energy and nuclear weapons programs, has given a couple of interviews to The Real News about the recent joint statement between Iran and the IAEA, the P5+1 talks, and a number of the most important issues and questions surrounding Iran’s nuclear program. The result is just a tremendous amount of clarity and information on these questions. I profited immensely from listening to him explain things. I HIGHLY encourage all readers to view these short but insightful interviews, which are accompanied by written transcripts, and to forward them on to a wider audience, because Bob really does address important current questions here and provides a lot of clarity. I also think Bob’s recommendation to Iran to voluntarily produce a full report on any past research on nuclear weapons makes a lot of sense, and would help take any remaining wind out of the sails of Iran’s detractors in the West and at the IAEA.